Wow, our 100th episode! As usual, Chris & Marie "politically incorrectly" cover news buried by the lamestream heebia, politics, new words/phrases, and other subjects as well as life advice such as being self sufficient, being resourceful, etc. Some listeners called in to chime in on things & share their wisdom as well! PC/smartphone compatible, downloadable. Chris & Marie discuss current events, announce new words/phrases of the week, get into politics a bit, have a few laughs. Special guest is Cesar Adolfo, Veteran and race realist, explains his interesting upbringing and awakening. A very interesting discussion! After a 5 week hiatus, Chris & Marie jump back into current events, announce new words/phrases, play moonman's contribution, and are joined by special guest-Hannah, who has interesting inside information on the infamous Charlottesville fiasco last Summer. PC/iPhone compatible, downloadable. Wow, this episode went on for over SIX HOURS! Dr. Duke graciously joins us, guiding us through an unbelievable zomatrix, the destructors of our people. The phone lines were open & an anti-White troll called in as well. Another must listen! Tom of newalbion.org joins Chris & Marie at 46:35 for a very interesting discussion of homelands/rights for our people and so forth. As always, politically incorrect, intellectually honest, informative & entertaining content! In this informative, entertaining episode, Chris & Marie are joined by very special guest, Jared Taylor of American Renaissance at 49:15! Several topics were discussed and a brief Q&A segment for Mr. Taylor. At 1:43, Jason Kessler joins to provide updates on what he's doing and drops a bombshell on what really happened at unite the right in Charlottesville last year. Another great episode! Special guest at 1:08:27-Bryden (aka Actual Racist @ActualRayCyst) of Third rail, Right to Bryden, & 86ers, all fun and informative shows. We go over zikes, cucks, & goycotts of the week, other current events, including tweets from our GREAT Twitter community, music, beer, and more. Don't miss out! PC/iPhone compatible. Another excellently entertaining & informative show! At 55:15, Moonman shares two Christmas songs with us; 1:06:15 mark-@AltSanta joins Chris & Marie; 1:38:25-@DesertFoxMulder joins in for discussion ranging anywhere from politics, race relations, zikes, cucks, & dindus of the week & more! Another informative, entertaining, NON "PC" show! Chris & Marie are joined by Harry Hughes, border patrol agent who shares from his several years of experience & to discuss other topics of the day. At 26:55, @Illegal_Aryan from Twitter who was present at the build Kate's wall demo at the White House in D.C. to share that & other lively conversation! 57:50=Moonman "10 feet higher" is played. PC/iPhone compatible, downloadable. Our latest! 44:24 minute mark, guest James Russell @RAJetweets, @ColchColl joins to share his perspective on issues affecting our people, share his online wealth of information, and so forth, contributing to a lively discussion!. At the 2:03 mark, John King calls in to add his valuable two cents. This is another must listen! This week, Christian Bell @BasedBritish of Twitter fame joins Chris & Marie at the 32:10 mark for an entertaining, politically incorrect, intellectually honest, and informative discussion on all sorts of modern day topics. Check it out! PC/iPhone compatible, downloadable. 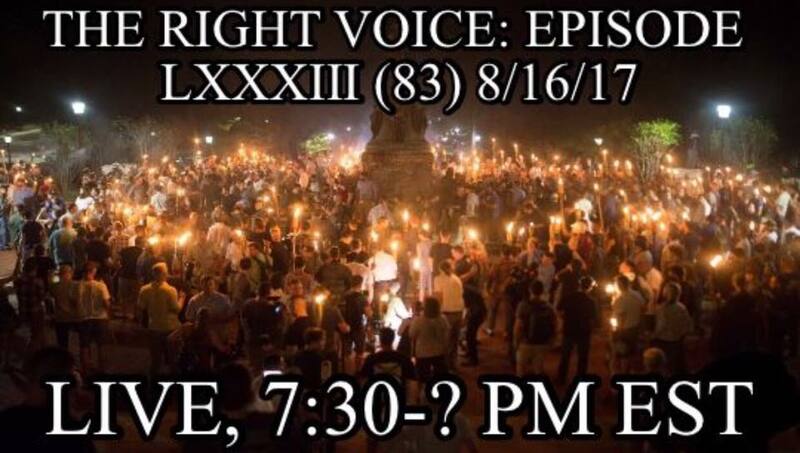 *SPECIAL EPISODE* for post #Unitetheright coverage-what the media did NOT tell you...Chris & Marie were joined by Jason Kessler, Tom Bowie, Pete Tefft, and many others. A must listen that brought us out of a near three month hiatus! 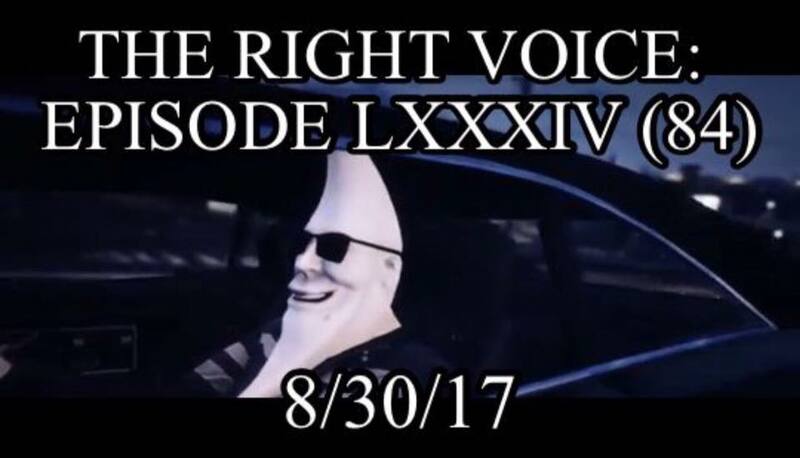 The Right Voice Episode 1: Coming Soon! Our first show will be Wednesday July 1st at 7:30pm Eastern Time. Please join us!